The Letter card represents news and messages. It's all forms of written communication. It can come in the form of a note, a document, email, text messages, and letters. The Letter also involves written documents, such as licenses, diplomas, certificates, and permits. It includes postcards, flyers, junk mail, and brochures. This Lenormand card's meaning really involves all forms of paperwork. It's anything that can be written. The cards around the Lenormand Letter give added meaning, explaining what kind of a message is coming, whether correspondence will arrive on time, and so on. On its own, the Letter card doesn't give much insight or understanding. The Lenormand Letter Meaning in Love: The Letter card means written correspondence with a loved one. It could be a love letter, an online relationship, or a Valentine's Day card. 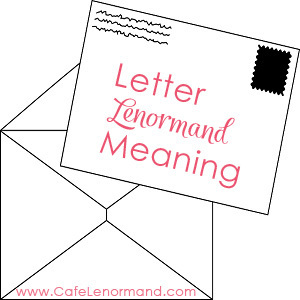 The Lenormand Letter Meaning for Career: The Letter indicates information is coming. It can also involve invoices, memos, résumés – any business related paperwork. In terms of a job, it can mean reporters, bloggers, writers, and postal workers. The Lenormand Letter Meaning in Health: The Letter card represents the hands and fingers. It can indicate prescriptions, test results, and referrals. Using the Letter for Timing: The Letter isn't a significant timing card traditionally. It can be used to signify the 27th of the month, but it's just as likely to not be assigned a meaning in timing spreads. Who do you need to write or email? Write your feelings and thoughts on paper to release them. Are all of your documents in order? What news are you expecting? Do you need to renew a license or permit?